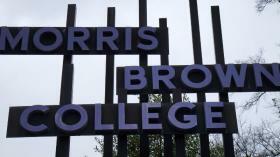 Morris Brown College’s plan to emerge from bankruptcy and eventually re-gain accreditation involves selling off a portion of the Atlanta school’s assets. “In order for us to get the resources needed, we’re going to have to divest ourselves of some of the physical assets,” Morris Brown president Dr. Stanley Pritchett tells WABE. Two recent deals to liquidate property fell through. Morris Brown is now asking a bankruptcy court for permission to retain a real estate agent to sell 35 acres. But peddling part of the campus to pay the debt could open the college to a new problem. “There is a connection with some of the properties related to a covenant with Atlanta University which is now Clark Atlanta University,” Pritchett says. Pritchett says Clark Atlanta gave Morris Brown about 18 acres of the land it is seeking to liquidate. But that land came with a catch– it must be used for educational purposes, or Clark Atlanta can reclaim its gift. The court filing only says Morris Brown will have to work “closely” with Clark Atlanta. The Atlanta Business Chronicle reports a hearing on the proposal is set for March 6th. Meanwhile, Pritchett says he believes the school will emerge from bankruptcy and regain accreditation within two years.